Kristopher Neil "Kris" Allen (born June 21, 1985) is an American musician, singer and songwriter from Conway, Arkansas, and the winner of the eighth season of American Idol. After being voted into the Top 3, Allen returned home to Arkansas and his hometown to film the material for the next two American Idol episodes. Allen's homecoming parade was greeted by a crowd estimated to be greater than 20,000. Allen performed at three concerts in Little Rock and Conway, Arkansas, playing many of his popular songs during the competition, including "Man in the Mirror", "Ain't No Sunshine", "Falling Slowly" and "She Works Hard for the Money" at the venues, as well as "Come Together" at the studio of local Fox affiliate KLRT-TV. He accompanied himself on all of these songs with his guitar. 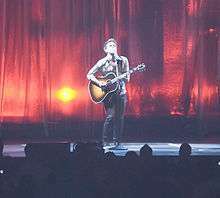 On May 20, 2009, Kris Allen was declared the winner of the eighth season of American Idol, becoming the first married contestant to claim the title, as well as the sixth winner from the Southern United States (only Jordin Sparks, raised in Glendale, Arizona; David Cook, from Blue Springs, Missouri; and Lee DeWyze, from Chicago, Illinois, were from outside the South). Allen also became the first winner to accept a trophy shaped like a microphone. Nearly 100 million votes were cast during the finale, setting a new world record for a televised singing competition. Unlike the previous season, the winning margin was undisclosed. Numerous sources, including the Associated Press, claimed that the margin "wasn't even close". Allen has admitted that the alleged disparity in votes was a "total surprise" to him. On February 19, 2010, Allen traveled to Haiti with the United Nations Foundation in order to raise awareness for the disaster relief efforts there as the UN and other groups continue to rebuild after the earthquake. Allen made his return to the Idol stage during the February 25th American Idol results show to share footage of his experiences in Haiti and to perform "Let It Be". This performance was made available for download as a charity single on iTunes after the show. On January 8, 2014, Allen entered the recording studio with producer Charlie Peacock to begin recording his third post Idol album at Peacock's studio in Nashville. "Prove It to You" was announced as the lead single on July 1, 2014, debuted at Yahoo Music on July 7, 2014 and released on iTunes on July 8, 2014. He performed multiple tracks from the album live acoustically on Yahoo. On August 12, 2014, Allen released Horizons. Allen did a tour of the U.S. and Canada with the group Boyce Avenue in the fall of 2014. Meanwhile, one of his songs off Horizons, "Lost" was used on the CW shows Arrow (in episode titled "The Secret Origin of Felicity Smoak") and The Vampire Diaries (episode titled "Alone"). Allen has continued to tour in early 2015, including performing at U.S. military bases in Italy and Portugal. He has stated that he plans to begin recording his fourth post-Idol album in the fall of 2015. Letting You In is Allen's fifth studio and was released on March 18, 2016. In March 2016, Allen toured for three months in support of the album. He announced work on a full-length holiday album in mid-2016. Somethin' About Christmas is set for release on November 4, 2016. Allen's humanitarian work has inspired his fans to organize charitable efforts in his honor. To celebrate Allen's 25th birthday, his fans donated over $25,000 to Heifer International, enough to pay for 50 cows to feed families in need. Inspired by Allen's support of music education, his fans also organized a donation of over $28,000 to Music Empowers in December 2010. In honor of Allen's 26th birthday, his fans banded together once again to donate more than $26,000 to Direct Relief International toward disaster relief. ↑ Farber, Jim (May 20, 2009). "Adam Lambert Falls in American Idol Upset as Kris Allen Takes Title". The New York Daily News. ↑ "Music is the Heart of our Soul". 1 2 3 Elliot, Peter (May 5, 2009). "Arkansas Pastors Shed Light on Idol Finalist Kris Allen". Everyday Christian. 1 2 3 Mansfield, Brian (May 22, 2009). "Kris Allen reflects on Idol upset win". USA Today. Retrieved May 7, 2010. ↑ Ingrassia, Lisa (June 8, 2009). "From Underdog to Idol". People. Archived from the original on July 23, 2011. 1 2 "American Idol Winner Kris Allen ready for tour, album". The Baltimore Sun. May 28, 2009. ↑ "Kris Allen Biography | The Official Kris Allen Site". Krisallenofficial.com. Retrieved 2012-10-05. ↑ "Kris Allen – Brand New Shoes Tracklist". LetsSingIt. LetsSingIt. ↑ Godinez, Bong. "American Idol Kris Allen: "Live on television is the worst thing in the world."". Philippine Entertainment Portal. Philippine Entertainment Portal. 1 2 Berman, Craig (April 14, 2009). "Simon slams Lil Rounds on Idol's movie night". msnbc.com. Retrieved May 16, 2009. ↑ Lang, Derrik J. (April 16, 2009). "Idol judges save Matt Giraud from elimination". Forbes.com. Associated Press. Retrieved May 16, 2009. ↑ "Kris Allen Rocks Arkansas in Frenzied Hometown Reunion". People. ↑ Jicha, Tom (May 20, 2009). "Kris Allen Wins American Idol". South Florida Sun-Sentinel. 1 2 "American Idol winner is crowned". BBC News. May 21, 2009. Retrieved January 5, 2010. 1 2 "Kris Allen: How can you not love the new American Idol?". Popwatch.ew.com. Retrieved 2014-08-13. ↑ "KRIS ALLEN DOMINATES THE BILLBOARD HOT 100". KrisAllenOfficial. KrisAllenOfficial. ↑ Graff, Gary; David J. Prince (June 19, 2009). "Adam Lambert, Kris Allen Team With Top Hitmakers For Debut Albums". Billboard. 1 2 "Toby Gad's featured news" (PDF). Toby Gad website. ↑ "Idols not idle in Twin Cities". StarTribune.com. 2009-09-03. Retrieved 2012-10-05. ↑ "Kris Allen and Chris Daughtry Together in the Studio". mjsbigblog. Retrieved 2012-10-05. ↑ "Kris Allen Hits Nashville to Co-write with Mat Kearney". mjsbigblog. 2009-08-04. Retrieved 2012-10-05. ↑ "Kris Allen's New Single - Live Like We're Dying | Kris Allen". mjsbigblog. 2009-09-15. Retrieved 2012-10-05. ↑ "'Idol' winner Kris Allen: single out in 2 weeks, album 'soft rock'; Megan Joy, Lil Rounds await news - Lehigh Valley Music Blog". Blogs.mcall.com. 2009-09-09. Retrieved 2012-10-05. ↑ Perlman, Jake (2009-09-17). "Kris Allen's rumored single, 'Live Like We're Dying,' leaks! (Idoloonies hold collective breath for 23 seconds!) | The Music Mix | EW.com". Music-mix.ew.com. Retrieved 2014-05-24. ↑ "Kris Allen (@KrisAllen4Real) op Twitter". Twitter.com. Retrieved 2012-04-04. ↑ PopEater Staff, Gary (November 6, 2009). "Kris Allen 'Live Like We're Dying' Video Premiere". AOL_PopEater.com. ↑ "Fall For Gold and Platinum". RIAA. RIAA. ↑ "AMERICAN IDOL SEASON 8 WINNER KRIS ALLEN TO RELEASE BRAND NEW SINGLE "THE VISION OF LOVE" AVAILABLE MARCH 26 AT ITUNES AND ALL DIGITAL PROVIDERS ON 19 RECORDINGS/RCA RECORDS". RCA Records. Sony Music Entertainment. ↑ "Kris Allen Album & Song Chart History". Billboard. Billboard. ↑ Parker, Lyndsey (2009-11-30). "A Tale Of Two Idols' Sales | Reality Rocks - Archive - Yahoo! Music". New.music.yahoo.com. Retrieved 2012-10-05. ↑ Smith, Grady. "Kris Allen talks to EW about working on his second album: What does he need to prove this time around?". Entertainment Weekly. Entertainment Weekly. ↑ 02/22/2010 (2010-02-22). "Kris Allen Answers Questions About his Trip to Haiti | American Idol, Kris Allen". mjsbigblog. Retrieved 2012-10-05. ↑ "Kris Allen Finds "The Truth" With Train's Pat Monahan | Idolator". 2010-04-27. Retrieved 2016-09-05. ↑ "American Idol Season 9 Finale: In Defence of Kris Allen". Cultural Learnings. 2010-05-27. Retrieved 2016-09-05. ↑ "'American Idol': On the scene for the finale". Entertainment Weekly. Entertainment Weekly. ↑ Young, John. "'American Idol': On the scene for the finale". Entertainment Weekly. Entertainment Weekly. ↑ "Kris Allen - "Alright With Me" (For The Fans) [VIDEO] | The Official Kris Allen Site". Krisallenofficial.com. Retrieved 2012-10-05. ↑ "Music | Lloyd Cele – Musician – SA Idols 2010". Lloydcele.net. Retrieved 2012-10-05. ↑ Halperin, Shirley (May 9, 2011). "'Glee' Season Finale to Feature Matthew Morrison Track (Exclusive)". The Hollywood Reporter. ↑ "24/7/365: Heinz Winckler: MP3 Downloads". Amazon.com. Retrieved 2012-10-05. ↑ "HFA Songfile". Harryfox.com. 2010-02-26. Retrieved 2012-10-05. ↑ "News for South Africa and the world". IOL. 2011-10-03. Retrieved 2012-10-05. ↑ "Walmart Soundcheck - Watch Javier Colon Interviews, Live Performances, Music Videos". Soundcheck.walmart.com. 2011-11-04. Retrieved 2012-10-05. ↑ "Kris Allen - judging Alchemy songwriting contest - on FOX16". YouTube. 2011-12-04. Retrieved 2012-10-05. ↑ "Kris Allen and Blackbird Academy of Arts Harmonize on Songwriting Contest to... - NEW YORK, Oct. 14, 2011 /PRNewswire-USNewswire/". New York, Arkansas: Prnewswire.com. Retrieved 2012-10-05. 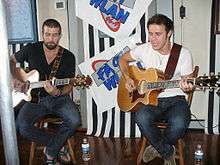 ↑ "Kris Allen Performs At Trevor Live | The Official Kris Allen Site". Krisallenofficial.com. 2011-12-24. Retrieved 2012-10-05. ↑ Christman, Ed (2011-08-23). "RCA's New Executive Team Named Under CEO Peter Edge Amid Layoffs (Update)". Billboard.biz. Retrieved 2012-10-05. ↑ "Radio Industry News, Music Industry Updates, Arbitron Ratings, Music News and more!". FMQB. Retrieved 2012-10-05. ↑ "Kris Allen Introduces New Songs at The Mint (VIDEO)". mjsbigblog. ↑ "AMERICAN IDOL SEASON 8 WINNER KRIS ALLEN TO RELEASE BRAND NEW SINGLE "THE VISION OF LOVE" AVAILABLE MARCH 26 AT ITUNES AND ALL DIGITAL PROVIDERS ON 19 RECORDINGS/RCA RECORDS". RCA Records. Retrieved 6 March 2012. ↑ "Vision of Love (Maison & Dragen dMac Edit)". YouTube. ↑ Faz, Jay (Jan 27, 2012). "Kris Allen – Vision of Love (Maison & Dragen Edit)". WhompingStereo.com. ↑ "'American Idol's' Kris Allen Announces Album Title, Release Date". Hollywood Reporter. March 29, 2012. Retrieved 2012-04-04. ↑ "Kris Allen Admits He Tried Out For the Lead Role in 'Rock Of Ages'". OK!. May 27, 2012. Retrieved September 29, 2013. ↑ Angermiller, Michele Amabile. "'American Idol's' Kris Allen Announces Change in Management; New Single". Retrieved 2016-09-05. ↑ Halperin, Shirley. "'American Idol' Kris Allen and RCA Records Part Ways (Exclusive)". Retrieved 2016-09-05. ↑ "Kris Allen Continues Curse Of 'American Idol' Male Winners". Retrieved 2016-09-05. ↑ "Twitter / KrisAllen: This will be coming soon. Be". Twitter.com. 2012-11-07. Retrieved 2014-05-24. ↑ "Kris Allen Reveals "Waiting For Christmas" EP Cover Art (PHOTO)". Mjsbigblog.com. Retrieved 2014-05-24. ↑ "Kris Allen Dedicates New Song to Newtown Tragedy Victims VIDEO". Mjsbigblog.com. 2012-12-21. Retrieved 2014-05-24. ↑ "Kris Allen's Instagram". instagram.com. Retrieved 2014-07-10. ↑ Parker, Lyndsey (2014-07-07). "See It First! Kris Allen Premieres Lyric Video for 'Prove It to You'". Yahoo! Music. Retrieved 2014-07-10. ↑ Parker, Lyndsey (2014-08-04). "Kris Allen Extends His 'Horizons' to Yahoo: See Him Perform! | Reality Rocks - Yahoo Music". Music.yahoo.com. Retrieved 2014-08-13. ↑ Allen, Kris. "Horizons Is Out". krisallenofficial.com. 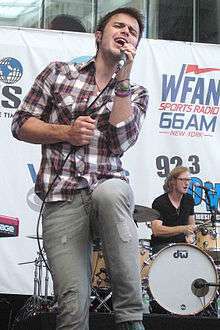 Kris Allen. Retrieved 27 August 2014. ↑ boyceavenue (8 October 2014). "NO LIMITS TOUR - 2014!!" – via YouTube. ↑ "Schedule - Armed Forces Entertainment". ↑ Elliott, Peter. 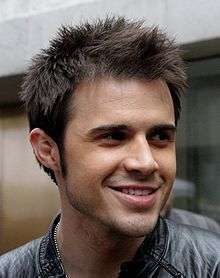 "Arkansas pastors shed light on 'Idol' finalist Kris Allen". Everyday Christian Media Corp.
↑ Caillouet, Linda. "Kris Allen's faith is quiet but strong". Arkansas Democrat-Gazette. Arkansas Democrat-Gazette. ↑ "Kris Allen". Give the Gift of Music. Give the Gift of Music. ↑ "Kris Allen: Thai mission trip & guitar story". Quoting Kradam. Quoting Kradam. ↑ "Kris Allen: "Land of Smiles" leaked". emusicality.com. emusicality.com. ↑ "Music Empowers Foundation Launches Spring Fundraiser - Kris Allen, Steven Van Zandt, And Others Join Cause". PR Newswire. PR Newswire. ↑ Mayer, Rana. "OK! Interview: Kris Allen is Honored by Little Kids Rock". OK! Magazine. Odyssey Magazine Publishing Group. 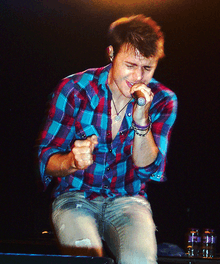 ↑ "Kris Allen Honored – Right To Rock Celebration– New York, NY – 10/21/10". mjsbigblog. mjsbigblog. ↑ "KRIS ALLEN GROWS A "STACHE" FOR MUSIC EDUCATION". KrisAllenOfficial.com. KrisAllenOfficial.com. ↑ "Kris Allen's Mustache". DonorsChoose. DonorsChoose. ↑ "Music Empowers Foundation & Kris Allen Partnership Benefits 47,000 Children of Needy Music Classrooms". PR Newswire. PR Newswire. ↑ "TOMS + Bridge2Rwanda pair up". TOMS Blog. TOMS Shoes. ↑ "Kris Allen to join in Barefoot Walk at UCA". Arkansas Online. Arkansas Democrat-Gazette. ↑ Parker, Lyndsey. "American Idol Turned American Hero: Kris Allen Heads To Haiti". Yahoo! Music. Yahoo!. ↑ Kaufman, Gil. "Kris Allen Sings 'Let It Be' On 'American Idol' For Haiti". MTV. MTV. ↑ "CHALLENGES REMAIN AFTER HAITI EARTHQUAKE, BUT THE UN IS STILL THERE". UN Foundation. UN Foundation. ↑ "Alright with Moo: Kris Allen Fans Give a Cow (or 50)". Heifer Blog. Heifer International. ↑ "ALRIGHT WITH MUSIC". KrisAllenOfficial. KrisAllenOfficial. ↑ "Raise Your Voices: Project Stand Together". Direct Relief International. Direct Relief International. ↑ "Kris Allen meet Kenya". World Vision. ↑ "5 Things You Didn't Know About Idol Winner Kris Allen : People.com". Tvwatch.people.com. May 27, 2009. Retrieved October 5, 2012. ↑ "'American Idol's' Kris Allen Welcomes a Son". Hollywood Reporter. 30 July 2013. Retrieved 30 July 2013. ↑ "Kris Allen Welcomes Daughter Rose Elizabeth". ↑ "Kris Up For a Billboard Award! | The Official Kris Allen Site". Krisallenofficial.com. Retrieved 2012-10-05. ↑ "2011 BMI Pop Music Awards List".